The numbers are tallied, and statewide voters at this week&apos;s Conservation Congress hearings approve of a wolf hunt, but it will be a while. 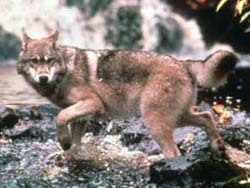 Arguments for the hunt include concerns that the wolf population was growing too much and hunters want to be involved in managing the population. Adrian Wydeven of the state DNR says opponents put up good arguments against a hunt. Also, some argue wolves could control the overpopulated deer heard. A great idea, Wydeven says, until they move into the agricultural areas and prey on farm animals. That&apos;s why hunting could be allowed in certain areas of the state, while giving them their space in forest areas. Either way, Wydeven says a hunt won&apos;t happen any time soon. Now that voters approve a hunt by a vote of 4848 to 772, Wydeven says the issue will go to the Natural Resources Board, and then the legislature will need to OK it, and there will be a series of meetings and hearings to get public input. Wydeven says any wolf hunt would be very specific, with limited licenses being issued in limited areas … all yet to be determined. Meanwhile, the DNR is continuing to survey the population and they hope to have a current population count within the next couple of weeks. Last year there were about 540 to 577 wolves in the state.